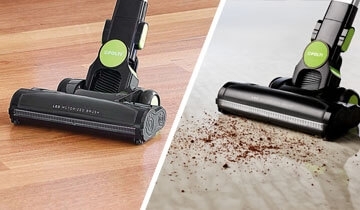 Forzaspira Slim SR110 is the rechargeable multifunction vacuum cleaner, which turns into a handheld cleaner in one click, to eliminate dust even in the most difficult to reach areas. 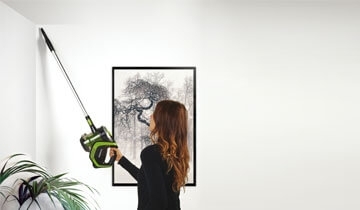 Lightweight and handy, it reaches anywhere; the cyclone technology and the 21.9 Volt Lithium Ion battery guarantee high performance and autonomy up to 50 minutes, for long cleaning sessions without interruptions. 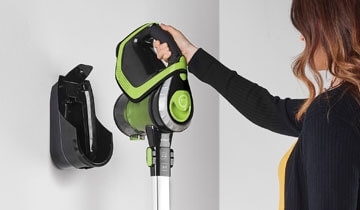 Equipped with a motorized brush with LED lights, it helps you to find even the most hidden dirt, cleaning all floors in the house, including carpets and rugs. The power is adjustable to two speeds to effectively clean all the surfaces of the house; the three filtration stages, including the HEPA filter, guarantee optimal performance and cleaner air. The kit for cleaning small surfaces ensures effective cleaning of furniture, shelves and bookcases, but also upholstery and car interiors. FOR CLEANING FROM THE FLOOR TO THE CEILING! Forzaspira SLIM SR110 is a light and versatile cordless vacuum cleaner that effectively cleans floors and carpets but also furniture, small surfaces and even ceilings. 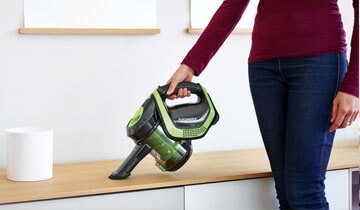 In a few simple steps it can be transformed into a portable cleaner, or to a vacuum cleaner with extension to clean even the most distant points such as ceilings or tall shelves. 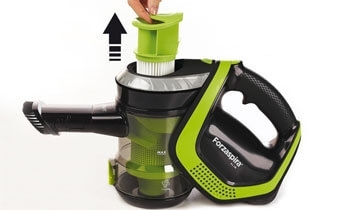 Forzaspira SLIM SR110 can be converted in a click into a practical and lightweight portable vacuum cleaner: just connect the lance accessory or the nozzle with nylon bristles to clean in the blink of an eye even the most difficult to reach spaces such as shelves, drawers, wardrobes but also upholstery and car interiors. The cyclonic action of the motor, combined with three filtration stages guarantees high performance and cleaner air: the different filtering stages trap even the finest particles of dirt. The Hepa 10 filter is removable and washable, while the collection bucket empties with a simple click, for a quick and easy cleaning of the appliance. 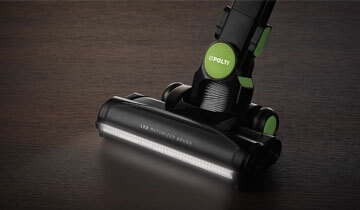 LED lights on the brush help detect hidden dirt, for even more effective cleaning. 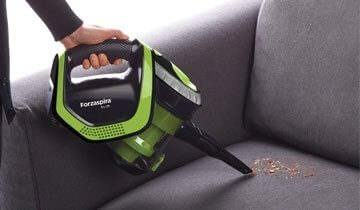 The motorized brush of FORZASPIRA SLIM SR110 with its mechanical action removes even the most difficult dirt, for maximum performance on all floors, including carpets and rugs. Forzaspira SLIM SR110 has an ergonomic handle particularly comfortable and manageable even during long cleaning sessions; it's wireless and lightweight at only 2.6 kg, so you can clean everywhere with minimal effort. Once the cleaning session is finished, it can be easily fixed to its wall support so it's always to hand for quick cleaning. The kit for cleaning small surfaces is ideal to thoroughly clean even in the most difficult to reach spaces: the lance is perfect for sofas, upholstery and car interiors, while the nozzle equipped with nylon bristles is ideal to remove dust even from bookcases and wardrobes. 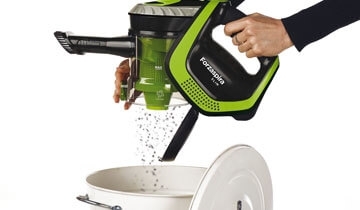 Forzaspira SLIM SR110 is bagless and this makes it easy and quick to clean: you just need a simple click to empty the the dust bucket! Forzaspira SLIM SR110 is equipped with a universal brush specially designed to be used on all floors, from those with tiles to carpets but also on delicate surfaces such as parquet. Suitable for vacuuming upholstered furniture, shelves and bookcases. 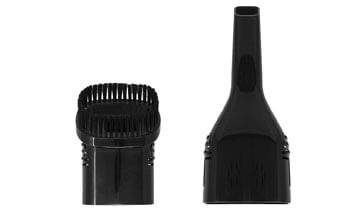 The bristles have a slight abrasive action to remove the most difficult dirt. To park Forzaspira SLIM after the usage and have it always at your fingertips. The battery charger can be connected to any power source, to recharge the vacuum cleaner in only 4h.